REPRO FREE – NO REPRODUCTION FEE. The visit of Dr. Rowan Williams, Former Archbishop of Canterbury, to the United Dioceses of Cork, Cloyne and Ross, in his capacity as Chairperson of the Board of Christian Aid, at a Special Service of Thanksgiving, marking 70 years of Christian Aid, at St. Fin Barr’s Cathedral, Cork. 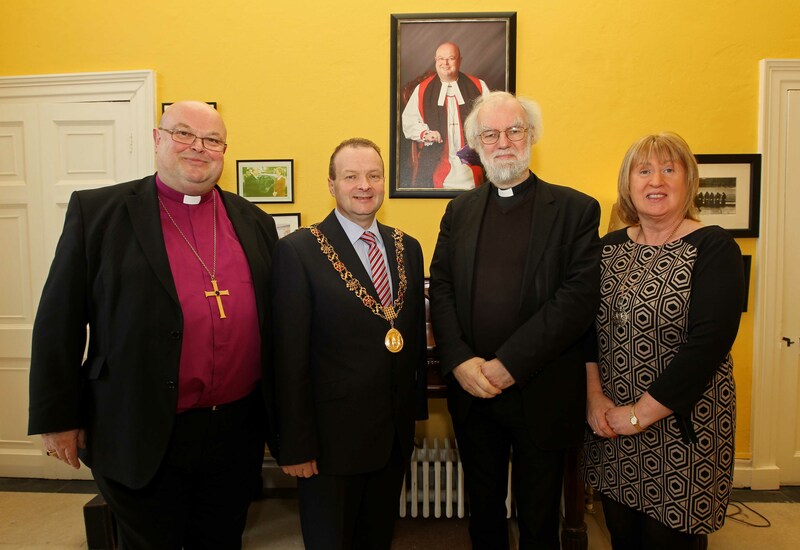 Attending a reception pre Thankgiving service, Bishop Paul Colton, Lord Mayor Cllr Chris O’Leary, Dr. Rowan Williams, Former Archbishop of Canterbury and Lady Mayoress Angela O’Leary, at The Palace, Bishop Street, Cork.